Western style dress with built in leotard, tube socks and hair bows. 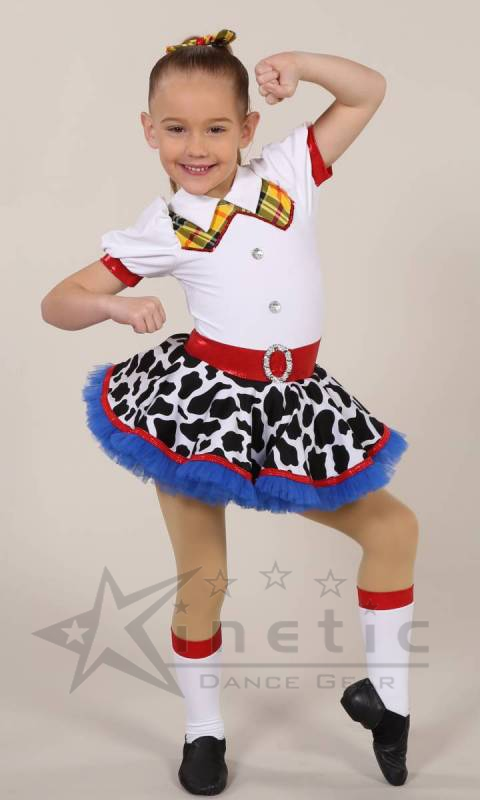 Cow print and yellow check lycra, diamante buttons, sequin trim and buckle details. Blue tulle petticoat. White nylon bodice, collar, sleeves + spats. Yellow check yoke, sequin trim + diamante buttons. Cow Print Skirt. Red fog cuffs, belt, spat topper + skirt bind. Blue knickers, blue tulle petticoat + ruffle. 2 x yellow check hairbows.